By now you are probably aware Google’s I/O conference is scheduled to begin this week. And one of the hottest products we’re expecting to see appearing into the world is the Nexus 8 tablet. Rumors proclaiming the existence of the slate have been intensifying in the past few weeks, but we still didn’t know the exact coordinates related to the tablet. The Nexus 8 is quite eagerly expected especially since LG’s Ken Hong announced the company won’t be making the next Nexus phone. So it appears the future of the Nexus line lies with the 8-incher that’s supposedly going to be unveiled in a few days. In anticipation of the big event, Android Police managed to get a hold of hot info detailing specs and pricing of the device. On top of that we get to see a picture of the tablet that has been nicknamed HTC Volantis (Flounder). Ok. So you’re probably extremely curious of the specifications, because the rumors couldn’t agree so far on what the Nexus 8 will come equipped with. Well it appears the slate will offer a superior 2048 x 1440 (281 ppi) resolution and draw life from – listen to this – NVIDIA’s Logan 64-bit processor (Tegra K1). This is contrary to what earlier reports claimed. First off, word on the street had it Google’s new slate will take advantage of the Moorefield 64-bit platform, but then another story surfaced claiming the chip inside will be Qualcomm’s. Incidentally, this weekend we argued in a story that the NVIDIA Tegra K1 chip might see success if implemented in tablets not smartphones. For the time being, Xiaomi’s MiPad is the only tablet taking advantage of the chip architecture, but Google’s Project Tango Dev Kits are also equipped with this particular platform. And with Google and HTC adopting the Tegra K1, NVIDIA might be headed on the right path. The device will be fitted with 2GB of RAM and either 16GB/32GB of internal storage. Two cameras will complete the picture, in the form of 8MP OIS main camera and 3MP front facing camera. The slate’s stereo speakers will live in front and the tablet will take advantage of the aluminum zero-gap construction. 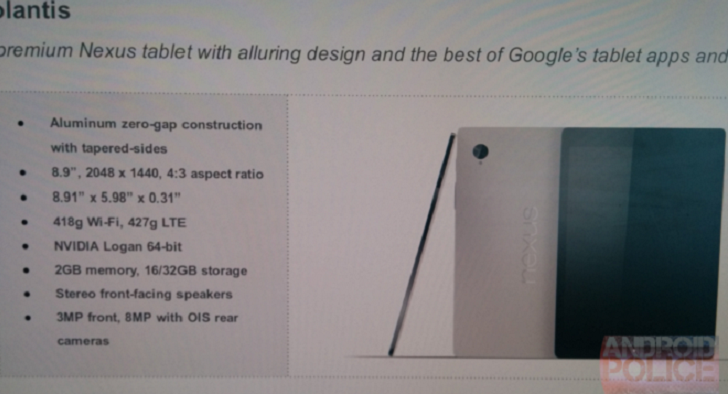 As for proportions, the Nexus 8 will be 8.91x5.98x0.31 inches / 22.63x15.9x0.79cm. The tablet will weigh 418 g / 14.74 ounces or 427 g / 15.1 ounces if we’re talking about the LTE version. By comparison the Nexus 7 (2013) weights 290 g / 10.1 ounces and 299 g / 10.5 ounces for the LTE model. Anyway, things get a little bit complicated when we take a look at the photo where some incongruities can be spotted. For starters, the front-facing speakers are nowhere in sight and the casing doesn’t really bring about aluminum zero-gap construction vibes. We’re either looking at an earlier model or the information might as well be fake. There’s also info about the pricing of the device. Apparently the tablet will sell for $399 / €293 when it comes to the 16GB version and $499 / €367 for the 32GB version. The LTE model will certainly be the more expensive one, taking you back with $600 / €441. So would you pay this amount of money for HTC Volantis?